Sometimes it feels like I went to school for three and a half years just for you to think that I’m a “glorified babysitter” or “play friend.” Like many pediatric occupational therapists, I’m sure, I’ve encountered this opinion far more times than I’d been warned about in school. I don’t mind if you think this, I just hope that you’d ask me what I’m doing rather than assuming it’s nothing but fun and games, with no plan in sight. I could create the most beautiful treatment plan for your child, and I could appear so organized and ready for our session, but if I don’t keep my eye out for little signs that a change needs to be made, then I can’t maximize the benefit of our session. In each little exercise or activity that we do, I am looking to create the just right challenge for your child. Imagine reaching up to grasp an item that’s just out of your reach, extending just a bit further, and getting that feeling of satisfaction when you successfully obtain that item. The benefit of this is that I observe where your child is today in terms of health, attention, sensory needs, etc. and I create a situation that I know will push them to a successful limit, without creating an over-the-top, frustrating situation for them. To accomplish this, I am constantly assessing and reassessing their needs and responses on a moment-to-moment basis. You may not realize it, but based on this information, I make changes or accommodations accordingly to increase or decrease this challenge. Another technique I use in my sessions is making them child led. This is where occupational therapists hear the typical “you just play with kids all day” comment. Yes, I play with kids all day, but no it’s not an 8-hour day of letting them run the show. Far from it . . . although I’m sure it looks like that half the time so again, please ask questions, and trust me on this! Some of the goals I may be striving toward when using child led therapy may include building rapport with your child; fostering a trusting, positive working relationship; allowing them free rein of the room so I can observe their natural interactions with toys, materials, etc. ; allowing them to problem solve and explore various ways that they come up with to play with toys or items in the room. 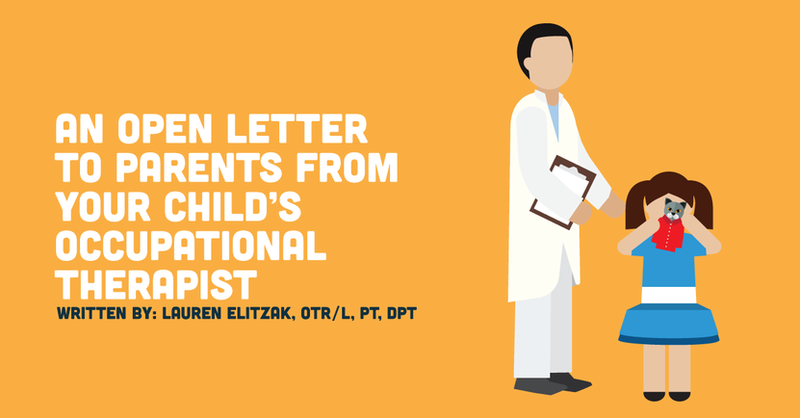 I may implement components of child-led therapy in order to accomplish some of these goals, as well as to allow your child to feel comfortable. However, this must occur within reasonable limits, otherwise, yes I am aware that they will, in fact, end up leading the session. This brings me to another method that I like to use . . .
At my clinic, as with many that I have gotten to experience, an obstacle course is generally used at some point during the session. This is one way that I may create environmental and sensory opportunities. By the toys I set out. If we are working to increase attention, I may use specific toys or activities to do so. I also may hide some of the more distracting toys or place them to be used as a motivator, earned during the session. I know you’re probably thinking “they’re just toys in a room,” right? But each likely has a specific, thought-out purpose for our session. The placement of the toys in the room. I place toys in various locations throughout the therapy gym, dependent upon the other kids in the gym during our session, the sensory environment, the anticipated needs of your child, and the goals we are working to address. As with any part of this process, I feel that it is essential we work as a team to develop an actionable plan to implement strategies in your home to carry over some of the work done during therapy sessions. I would love to work with you to implement some of these strategies in your home to increase your success and that of your child, as well as hopefully alleviate some stress and answer questions along the way. If you ever have any questions or wonder what I’m doing or why, I really hope you’ll ask me. I can assure you that my apparent silence on the outside comes with a caring heart for your child, as well as a great deal of training, observations, and planning happening on the inside.